Part of the settlement in Idye settlement area of Makurdi devastated with flooded. 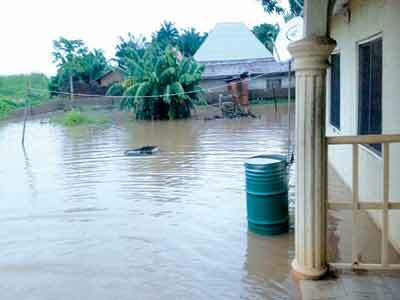 A Heavy downpour that lasted from 6:00pm on Tuesday evening to 5:00 am the following day, has wreaked severe havoc in Makurdi, the Benue State capital, destroying houses and property in different parts of the metropolis. The Guardian’s observation of the situation in the metropolis revealed that residential buildings, shops in Wurukum market, Wadata, Kaamem, Idye, Agboughoul, Atsusa Media village, Gyado villa and as well as Modern Market and Radio Benue where the transmitter room is located, were devastated by flood water from the heavy downpour. Inspecting the devastation caused by the flood, Governor Samuel Ortom, who expressed shock over the harm caused by the downpour, directed the Ministry of Works, Urban Development and Housing to put heads together to identify all the illegal structures built on water channels for urgent demolition. Expressing worry over the damage caused by the rain, a resident of Kucha Utebe settlement along Gboko road, Mr. Akunde Ikpa said the rain, which started like a joke, spanned through the night raining cats and dogs thereby soaking their houses and destroying much of their household belongings. Mr. Ikpa attributed the high flooding of their area to lack of drainage and appealed to the Benue State government to act fast by constructing drainages in the area to avert further flooding. At the Idye settlement opposite One-4 police headquarters, Makurdi, almost the entire settlement was submerged in flood water as residents recounted their ordeals of spending sleepless nights trying to relocate their property. A housewife in the area, Josephine Tsueka, told The Guardian that she lost her valid educational certificates and other documents to the submerging flood as her entire compound was overwhelmed with the raging water. Mrs. Tsueka appealed to the state government to act fast by finding solution to the perennial problem of flooding in the area, even as she appealed to the new administration to investigate what became of the ecological fund contract awarded to CAD company to construct the major drainage running from Wurukum round-about through Idye basin to the House of Assembly quarters some years ago. She also called for the immediate opening of streets and building of drainages in the IdyeIbi settlement as well as demolition of all structures encroaching on the drainage channels. Meanwhile, more fear is gripping the state residents as the Camerounian authorities have issued an alert and has started the release of water from Lagdo Dam. A similar release of water from the dam in 2012 caused River Benue to overflow its banks causing insurmountable havoc in the state.